Decent enough bathroom rugs. Thick enough and light weight enough to dry between showers. Nice design. The price was fair but not great. Found something comparable at TJ MAX. Our Super Soft Spa like 100% Pure Cotton Bath rug is fully reversible. It's like getting two rugs for the price of one. Both sides of the rug feature a thick, plush and absorbent pile. Since it has no backing, a non-skid rug pad is highly recommended. With a variety of color and size options, this rug is sure to meet your bathroom design needs. This is a well priced mat set and are very comfortable. I think they are actually nicer live than in the picture. The colors really contrast and look good together. Most importantly for me, they are well padded and soft. Bought these for my newly remodeled bathroom. 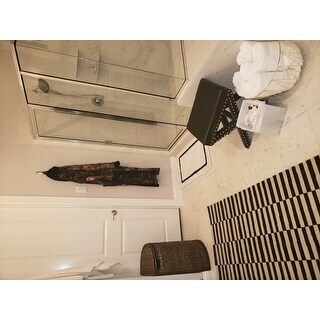 Like the fact that I can have shower, vanity, and toilet rugs that match. Also, they are reversible and washable so I anticipate they will last a long time. Nice, simple bath mats. I will keep searching for the perfect fit, but it works for now. My main rug is cream and black, this rug is a little to white. But it works well in my toilet space. I like the softness and thickness of these mats. I do not like the color. I bought the grey set but, pictured only the stripe to be grey. The rest of it is a dirty looking grey. Color wise, I do NOT recommend these mats. Maybe in a different color they would be nice. White part is not really white. Has a gray to it. This is the perfect compliment to the shower curtain I purchased. 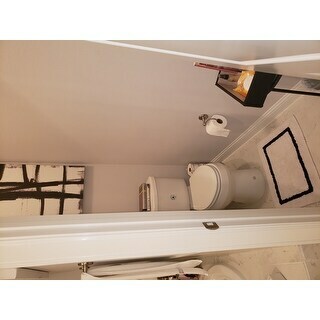 These are clean and classic which is the look I wanted in my remodeled guest bath. Price was great especially for a set of two. It was nice to find a set without one being a toilet mat....so passe! My only concern is how they will launder especially if it has stains. Like these and their reversible so for a quick clean look, turn them over, then color goes well in the bathroom I put them in. Like that they are reversible. Just what I wanted for my black and white bathroom. The rugs are a good value for the money, however their description doesn't hold reality. Certainly soft and I will keep them, but the lushness is not as described. The Platinum color is darker than screen, which is expected. If you're looking for something lighter then go with the silver. Overall, good buy and I am keeping them. Beautiful thick rugs and perfect size. Looks like I spent a lot more. The rugs are closer to a greige than white, which makes them look dirty. They also trap dust and are difficult to clean. Completes the look of my bathroom. Simple and elegant. just what i need at home for my new bathroom! !